A few caveats. I know this is reductive, I know that title quality is a (mostly) completely subjective phenomenon, and I admit that these three levels are merely lines I’ve drawn on a broad spectrum. Still, I think this is a workable classification system for the creative writer, and a decent roadmap besides. As I put it to the class: allow enough space in your brain for brilliant title ideas to crash land without warning, and be on the lookout for titles that sound strange and wonderful for a few minutes, but reek when you open Word the next day. Otherwise, aim for the middle. The “middle” being tier two: Not Terrible. Seventy to eighty percent of short story titles fall here. “Cathedral,” by Raymond Carver, is a not-terrible title. It’s a grand word, even an imposing one, calling to mind great structures and systems, and yet the lack of a definite article renders it anonymous and ordinary. All of which befits an ostensibly low-key story about domestic epiphany. Compare that to “Gazebo,” a resident of Terrible territory. Probably only a tenth of story titles are actually bad, and this isn’t one of the worst of them. I don’t actually even mind the word gazebo–it sounds fun, like a clown’s name–but it’s no cathedral, and doesn’t benefit from the elision of the article. If it had an article, “The Gazebo” would edge closer to Not Terrible; at least we could expect the titular gazebo to serve as the site for some interesting goings-on. But while separating the from cathedral still leaves us a rich, intriguing symbol, cutting it from gazebo leaves us with . . . gazebo. If you didn’t know the author, would you want to read “Gazebo”? What about “Trellis”? What about “Rake,” or “Pruning Shears”? To round out our Carver triptych, we have “Bicycles, Muscles, Cigarettes.” If you’re asking me (and you are, apparently), this one is Great. Aside from being a delightful, chunky collection of sounds, it’s a simultaneously sardonic and self-serious list of manly objects, in ascending order of maturity–“manliness” and “maturity” being two subjects scheduled for demolition at the story’s climax. And it stands out without being totally off the wall. Quick–what’s another story title composed of three plural nouns? So there you have, roughly, the three grades of short story titles. But for further taxonomic interest, let’s consider some of the most common types of titles, remembering that titles alone are what we’re talking about, not the stories themselves. Might as well take a cue from Ray again, and begin with the One-Worder. The one-worder is a classic, from Chekhov’s “Nerves” up through Alice Munro’s “Fits.” Both of those are decent, I’d argue–solid if unremarkable eighty percenters. Then you’ve got “Emergency,” by Denis Johnson, which is fairly great, and “Give,” by James Salter, which is just terrible. (Poor James Salter. The man writes exquisite, harrowing fiction, and his tables of contents read like the track listings of pretentious/mediocre folk albums.) “Salt,” by Isaac Babel, is so mundane it’s lovely. “Apostasy,” by Mary Robison, is full of intrigue. Not so much classic as ubiquitous, the “The” title is a phylum compared to the classes on this list. A random survey: “The Swimmer” (Cheever), “The Death of a Clerk” (Chekhov), “The Babysitter” (Coover), “The Semplica Girl Diaries” (Saunders), “The Robbery” (Eisenberg), “The Garden Party” (Mansfield). And on and on. Almost by their nature, “The” titles are Not Terrible. As the Carver examples above demonstrate, the definite article can add interest or even menace to an otherwise innocuous title (“The Little Girl” by Grace Paley; “The Room” by William Trevor), or cast an ironic or mocking light on something more colorful (“The Death-Dealing Cassini Satellite” by Adam Johnson). It’s so common a baseline that deciding not to name a story “The Something” can be considered the first step of the titling process, whether or not it’s done consciously. What’s the main character’s name? Vanka? Okay then. Let’s call this one . . . “Vanka.” (Chekhov.) To some extent, the success of naming a story after a character depends on the character name in question. No one’s going to skip over “The Death-Dealing Cassini Satellite” to read “Larry.” But “Camilla” (Robison) has a nice ring, a little mystery somehow, and “Ruthy and Edie” (Paley) at least implies a relationship. Name titles aren’t limited to names alone, either–the name might only become interesting because of the words around it: “Darcy in the Land of Youth” (Frank O’Connor), “Morris in Chains” (Coover). And then there are possessive titles, like “Simon’s Luck” (Munro) or “Mrs. Acland’s Ghost” (Trevor). Risks of the category include cliche and general tweeness. The Wackadoo forgoes convention in favor of polka dots and arm flailing. It might be unusual in a relatively quiet way (“Nothing: A Preliminary Account”; Barthelme), or it might be full-on madhouse (“Evening of the Yarp: A Report By Roonswent Dover”; Hannah). Authors of this type of title include acknowledged weirdos like Haruki Murakami (“The Fall of the Roman Empire, The 1881 Indian Uprising, Hitler’s Invasion of Poland, and the Realm of the Raging Winds”), as well as ostensible regulars like Lorrie Moore (“People Like That Are the Only People Here: Canonical Babbling in Peed Onk”). As with the other categories, there is crossover and relativity among the wackadoos–“Sorry Fugu” and “The 100 Faces of Death, Volume IV,” both by T.C. Boyle, are each weird, but in different ways. This is perhaps the riskiest category, with the highest ratio of Terrible and Great titles to Not Terrible ones. The Play On employs some kind of twist–it gestures in the direction of the expected, but delivers a quirk. Frank O’Connor’s “Don Juan (Retired)” uses a parenthetical insertion to specify what era of Don Juan we’re getting, and disrupts a classic Name title. “Bats Out of Hell Division,” by Barry Hannah, is a stock phrase until the final word reveals that we’re talking about a military unit. Trevor’s “O Fat White Woman” has the look and pleasing sonics of an ode, but not the subject you might assume. And the same might be said of Eisenberg’s “The Girl Who Left Her Sock on the Floor”–those first three words could lead into any number of interesting, frightening, mysterious, or dramatic clauses, and yet the title gives itself over to what seems like a most inconsequential specification. These types of titles define themselves in relation to what they are not–they’re three parts normal, one part wackadoo. Of course there are plenty of other types of titles. This list is not even close to being exhaustive. And, as can be seen even from the examples above, there’s no shortage of cross-pollination between categories, and a given title might sit comfortably in several at once. The category isn’t important, anyway–what’s important, when engaged in the art of titling, is to strive for Not Terrible. If you have the energy to strive for Great, then by all means, strive. Failing all else, name the piece after a weapon. 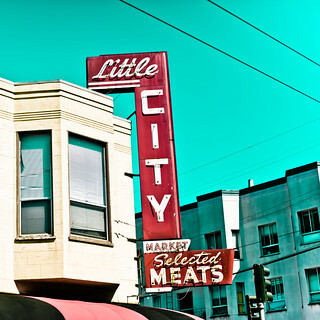 “Little City Selected Meats, Plate 2” by Thomas Hawk.